9 April to 8 May, or 10 September to 9 October, 30 days in Tibet. This trip may seem inexpensive. The reason is: no one from our organization goes on the expedition. It is unaccompanied. The prices quoted is not include basecamp services and supplies, nor do they include any high-altitude services and supplies. These can be hired and purchased at a nominal additional cost. You must provide documentation that you have climbed to 5000 metres within the last three years. You must provide us with the completed medical forms, signed by your doctor. Prior to joining our group, please see your doctor and obtain the necessary permission and advice, as well as medications for travel in extremes of altitude, and also for exotic locales. To participate in this climb you must be a very fit and active cold-weather climber and camper in good health. Obviously, Nojintangla is a relatively high and remote peak, and there are significant hazards present. Members must have knowledge of roped winter climbing techniques to protect for crevasse-falls, as well as use of fixed lines. Above ABC, all members must be prepared to join a rope with another team member. You must have an awareness of altitude sickness, frostbite, and the recognition of their symptoms, prevention, and treatment. You must join this expedition with a climbing partner, or hire a Nepalese Sherpa or one of our Tibetan Mountaineering Students to accompany you. If you do not know anyone who will climb together with you, please join our "secure climbing partner chat room" (coming soon). We only welcome members who agree to the following: Above Advanced Basecamp, all members must be roped to another team member. Neither solo climbing, nor descending, are allowed above Camp One. Make sure you have physically trained yourself very thoroughly before joining this climb. You must show proof of travel and mountain rescue insurance, and you must provide an "emergency letter", showing the contact details of a person ready to wire funds on your behalf. Basecamp kitchen, cooks, meals, dining, and sleeping tents: $2450 USD. High altitude sherpas, tents, equipment, walkie-talkies, food, stoves, fuel, etcetera: $2450 USD. *Our “low budget” trips include: round-trip return transport from Kathmandu (you could also approach from Beijing), hotels and guesthouses and meals in route, permit, and liason officer. More services can be provided, with adjustments in cost. For example, we can provide basecamp tents, cooks, meals, tables and chairs, high-altitude tents, food, and cookers, oxygen, western guides, and any other items you might require. Or, for the truly frugal and independent people, we can provide only the permit, liason officer, and transport to/from basecamp. We are able to reduce the costs by climbing and trekking simply, using basic and comfortable services. 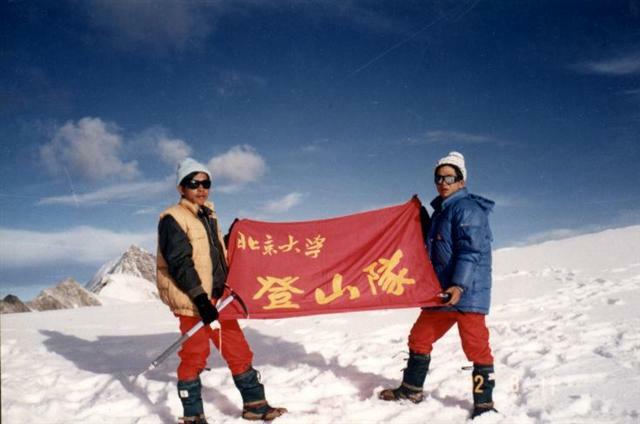 Because we have been climbing and trekking Himalayan peaks since 1986, and have brought many groups and individuals over the years, you will benefit from a special relationship we have with the Chinese Mountaineering Association (CMA), the Tibetan Mountaineering Association (TMA, CTMA), the Xinjiang Mountaineering Association (XMA, CXMA), the Kashgar Mountaineering Association (KMA, CKMA), and the Nepal Ministry of Tourism, Mountaineering Section. 2 In Kathmandu; visit temples; city tour; shopping. Hotel. 3 Bus to Zhangmu, Tibet (2400 meters); drive to Nyalam (3,750 m) Hotel. 5 Bus to Tingri (4,342 meters). Hotel. 6 Bus to Shigatse; visit Tashilunpo Monastery (3,950 meters). Hotel. 7 Bus to Lhasa (3,650 meters). 8 Sightseeing in Lhasa. Hotel. 9 Drive to temporary basecamp at Banuco village. 4,800 metres. Camping. 10 Hike with equipment and yaks to Basecamp. 5,250 metres. Camping. 12 Explore route to camp 1, return to basecamp. 13 Hike to camp 1. Sleep in camp 1. 5,950 metres. 14 Explore route to camp 2. Return to basecamp. 16 Hike to camp 1. Sleep in camp 1. 17 Hike to camp 2. Sleep in camp 2 (6340 metres). 18 Explore route to camp 3. Return to basecamp. 21 Hike to camp 1. Sleep in camp 1. 22 Hike to camp 2. Sleep in camp 2. 23 Hike to Camp 3, 6760 metres. Sleep in camp 3. 28 Day of Organizing in Basecamp. 29 Bus to Lhasa. Hotel. 30 Return flight to Kathmandu. 31 Extra day in Kathmandu. 32 Fly back to home country. Nojin Tangla mountain range, located only 79 kilometres from Tibet's renowned capital city of Lhasa, stretches east to west in central Tibet. Its glaciers are a major source for the Yarlung Zangbo River, which flows from Tibet to India through Bangladesh and into the Bay of Bengal. The highest peaks in the range are rarely, if ever climbed, top 7000 metres, and are concentrated prominently in the middle of the range on a long ridge. We will attempt the standard route, a line up the relatively safe south face to the Central peak (7117 metres). 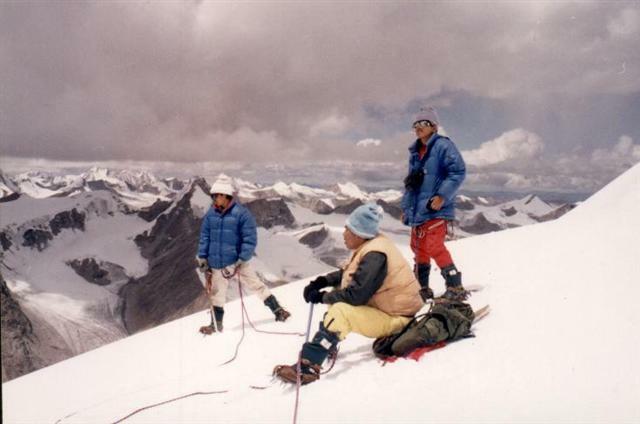 We have been traveling through the area near to this peak since 1987, and visited the lower basecamp in 1998. 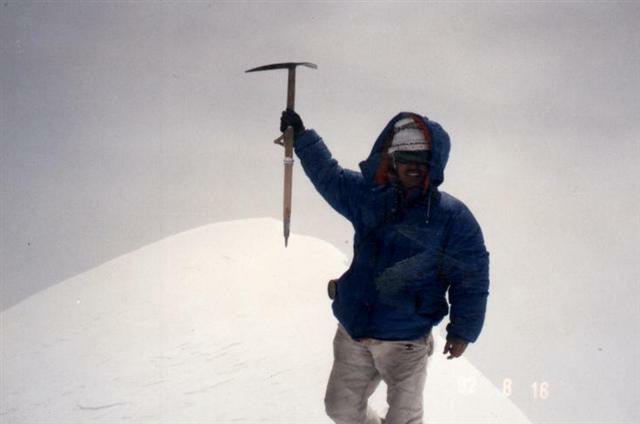 Finally, after much preparation, we climbed it in 2001, placing the first westerner nd first Tibetan on the summit. After making the scenic drive from Nepal (you could also approach this peak from Beijing) across the Tibetan Plateau, past Mount Everest, we arrive in Lhasa, the capital city of Tibet, where we will spend a day resting and touring the city, paying a special visit to the Potala palace. The next day we will load all the equipment in our vehicles and drive several hours north west of Lhasa to Damxung County with great views of the Nonjin Tangla range from the highway. Around Banuco village, we will drive off-road over the Tibetan plateau for a short while to a flat pasture at the foot of the mountain. This is where we establish a temporary basecamp (4800 metres), on the banks of the Banuco River. After acclimatizing adequately, we will load up yaks and hike for 4-5 hours up the Banuco river valley to basecamp (5250 metres). Basecamp is situated on a small grassy patch between towering peaks across from a large flowing glacier. The Central Peak rises to our right, or north, and 6000+ metre peaks flank us on the left, or south. A constant water supply is present. 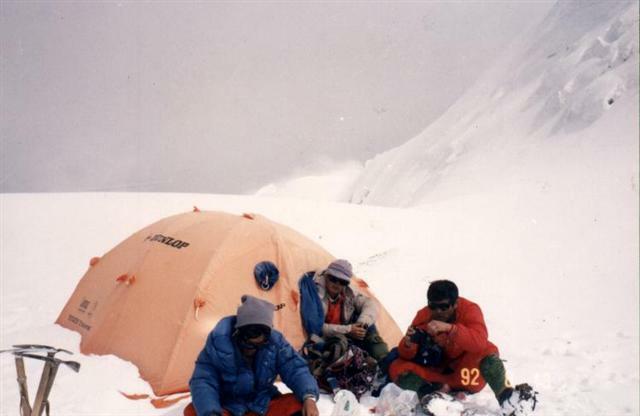 Climbing around 5400m to camp 1 (PUMA photo). Striking a dramatic pose in a flat camp 1, 5950m (PUMA photo). The route up to camp 1 (5950 metres) follows the river valley, then climbs onto a moraine. 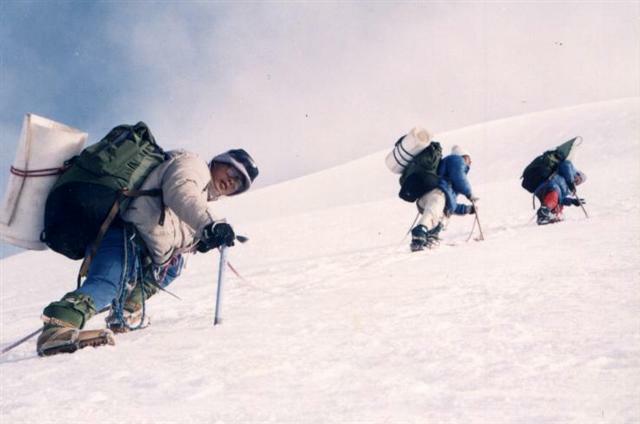 Climbers meander along the moraine for 4 hours until reaching the base of the glacier. The glacier is mostly a gentle incline, around 10-20 degrees. We continue up from this point for around 2 hours to camp 1, which is located on a flat snowfield next to a 6000 metre peak. From camp 1 the grade steepens to around 50 degrees. We will fix rope as necessary. After 4 hours of climbing and crossing several small crevasses, we reach a small 50 square metre plateau. Camp 2 at 6340 metres (PUMA photo). The route to camp 3 is the most challenging part of the climb. On the way we navigate some large crevasses and hike up ridge-like sections with drop-offs on both sides. We will be roped together alpine style or fix lines in areas where we may come close to cliffs. 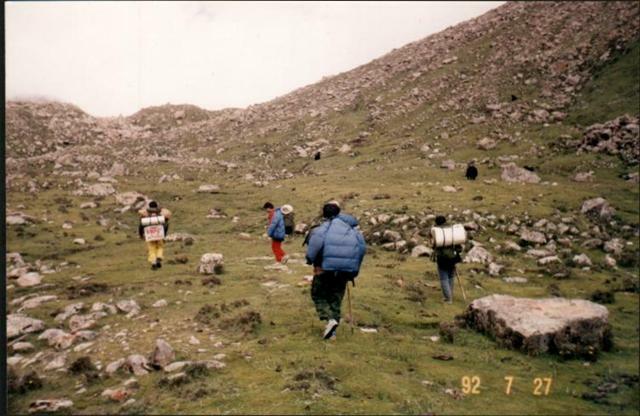 On the way to camp 3 (PUMA Photo). After a steepish climb, we hike over a rise and come to a large flat area with views of the summit ridge. We will set up camp 3 (6760 metres) at this point, and this day will be the longest; around 8 hours. The central summit, 7117 metres (PUMA Photo). We will set out a little before sunrise for the summit, which is normally just 5 or so hours away. We will continue up the south slope to a low point on the East Ridge, then up the East Ridge to the central summit of Nojintangla, elevation 7117 metres. Please review our personal equipment list and group equipment list to get an idea of what you may need for your Nojin Tangla expedition. This is not a guided expedition, and team members are expected to be able to care for themselves. This is not a guided expedition, and team members are expected to be able to care for themselves in a winter-camping environment. You must provide documentation that you have climbed to 5000 metres within the last three years. There are hazards present, and members must have knowledge of roped climbing techniques (to protect for crevasse-falls). 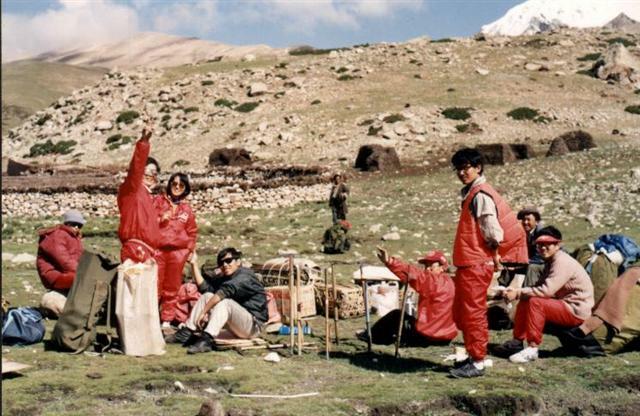 It is also required that all members will have an awareness of altitude sickness, frostbite, and the recognition of their symptoms, prevention, and treatment. Above Camp 1, all members must be roped to another team member. Neither solo climbing, nor descending, are allowed above Camp 1. You must join this expedition with a climbing partner, or hire a local climber or sherpa. You must provide documentation that you have climbed to 5000 metres within the last three years. To participate in this tour you must be a very fit and active winter-walker in good health. Prior to joining our group, please see your doctor and obtain the necessary permission and advice, as well as medications for travel in extremes of altitude, and also for exotic locales. Make sure you have physically trained yourself very thoroughly before joining this climb.